You can always contact us for a free consultation with one of our cosmetic nurse specialists (free consultations do not include doctor visits, major PPO insurance is accepted for medical visits). As you age, your skin will age as well, losing the natural support that gives it a youthful appearance. Much of this aging is caused by a decrease in collagen and elastin within the skin, resulting in wrinkles and creases. As the next generation in wrinkle correction, Radiesse is a dermal filler composed of calcium hydroxylapatite, a naturally occurring mineral form of calcium which can corrects aging skin. Contact our Burbank Cosmetic Dermatologists at Advanced Dermatology Center to discuss whether Radiesse can help you look and feel younger. Injected through a small needle just below the skin's surface, Radiesse is designed to stimulate the growth of your body's own natural collagen. Even better, Radiesse is more than just a temporary fill-in for facial folds and wrinkles - it rebuilds your skin's foundation from the inside out and restores a beautiful and youthful appearance. You can now achieve younger and more radiant skin without surgery. Immediately following your treatment, there is a chance of experiencing some minor side effects, including temporary swelling or redness on the first day. Also, patients may experience some bruising, particularly those who are taking aspirin or other medication that thins the blood. This bruising will typically clear within a week. Our team can even discuss ways you can decrease the possibility of bruising before your treatment. 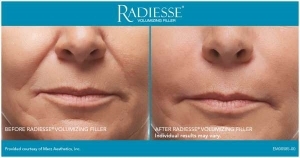 Areas Treated - Radiesse corrects moderate to severe facial wrinkles and fold such as around the nose and mouth, including nasolabial folds, marionette lines and smile lines. We also treat the cheeks and other hollow areas of the skin to create more volume and a plumper, more youthful look. 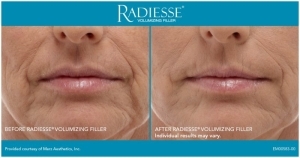 Results - Radiesse stimulates new collagen growth and plumps and fills in wrinkles and folds in the skin. Treatment Interval - Most patients experience correction for 9-12 months. Treatment Time - 30-60 minutes. Schedule a Free Consultation with one of our Cosmetic Skin Specialists Today at (818) 284-4003. 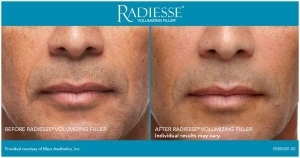 From correcting moderate and severe facial wrinkles and folds around the nose and mouth to filling out cheeks and other hollow areas of the skin with more volume, Radiesse can treat a number of areas on the face and provide you with the healthy, natural, and youthful look that you've always wanted. Speak with our Burbank Cosmetic Dermatology team to set up your cosmetic consultation. Contact our Dermatology Specialists today and find out more about Radiesse.